Building an effective team is crucial to achieving startup success. If you’re in the early stages, attracting a team may still seem like a distant dream. But, any viable startup with growth potential requires a team – and you may need one sooner than you think. Many view the founder or CEO as being the most important indicator of startup success, but even tech entrepreneur mogul, Mark Zuckerberg disagrees. “The most important thing for you as an entrepreneur trying to build something is, you need to build a really good team,” said Zuckerberg at a 2011 conference. While a visionary founder may be the catalyst needed to form a startup, it takes a high-functioning team to develop a product and grow a startup into a sustainable company. 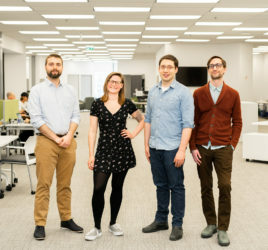 According to a study from Rotman School of Management, a new business’s success often depends on the founder’s ability to build a great team around them. The study reveals that though the founder’s characteristics are important, what is more important is the team they lead. Author, Neil Patel highlighted interesting research on how a startup’s success can be impacted by its team. 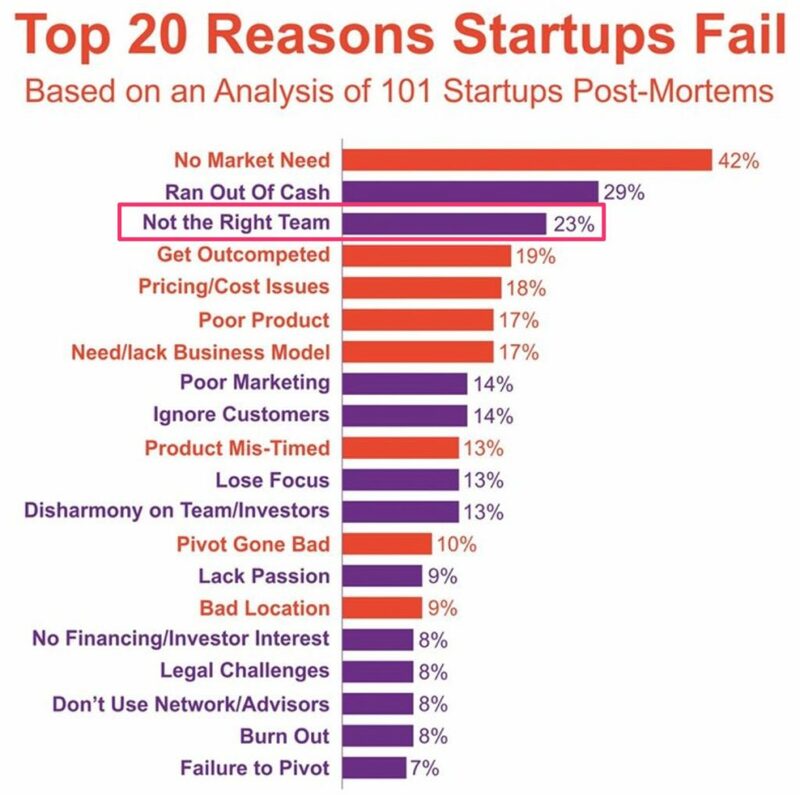 He pointed out that the wrong team can be detrimental to a startup and is one of the top reasons why startups fail. If you’re launching or running a startup, you’ll need a stellar team to meet milestones and move your idea or product forward. Here are our tips for building an effective startup team. Being able to identify the skills your company needs is the first step to building an effective team. This often starts with developing self-awareness as a founder – know what you’re great at and admit what you need help with. High self-awareness will help you hire the right people to get the tasks done that you can’t or don’t want to do yourself. Even if you’re not ready to add anyone to your payroll, you should still scout for high-potential talent to join your team. Starting the conversation early with potential hires means you will be first to mind when they’re looking for work. One study suggests founders should look for “startup joiners” when building a team, as they often possess similar characteristics as entrepreneurs. Joiners are people who don’t necessarily want to be startup founders, but instead want to work for one. They are considered a hybrid between founders and traditional employees – they’re less risk-averse as traditional employees and value autonomy at work. However, the study states that joiners are often interested in “technical or functional work activities”, as opposed to managing and building the company like founders are. When you are beginning to build your startup, resources – including money to pay competitive wages – are often scarce. It’s rare to find experienced talent that will work for low wages. One strategy for attracting high-potential talent is to scout at universities and community colleges. And, if you have the budget, hiring a co-op student. As an entrepreneur and a leader, it will be your job to build a talented team that works like a well-oiled machine. Finding skilled professionals is important, but selecting talent that are the right fit for your organization (and existing team members) is key. When hiring team members, consider not only the individual’s ability and personality, but also how well you think they will work with current members of your team. 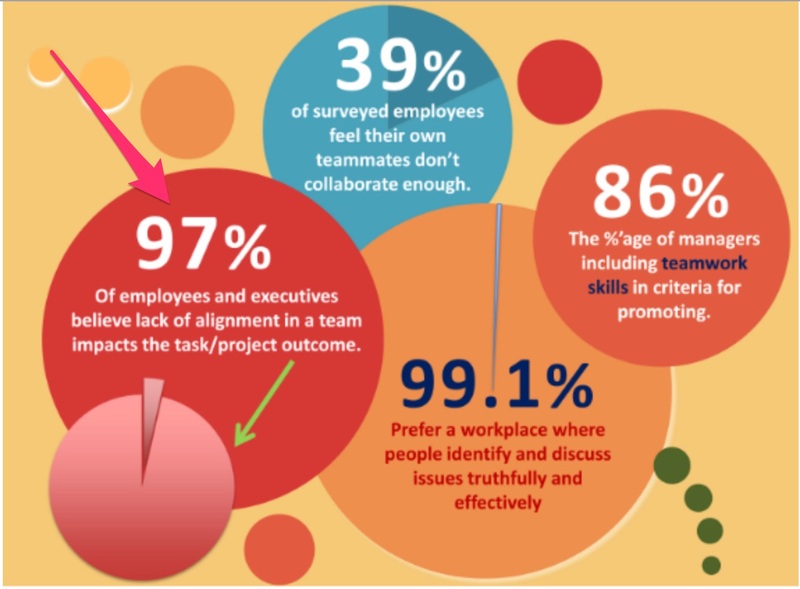 Team member alignment is important – 97 percent of employees feel a lack of team alignment impacts their performance. Sometimes it’s not about who you hire, but how you integrate a new hire into your team. Maximize team effectiveness by dedicating time to helping team members connect with one another. A great team needs a common goal to work towards. It’s the founder’s responsibility to ensure the team is aligned with company objectives. This won’t happen if you’re not communicating your company vision to your team. When communicating your “big picture” vision, it’s important to remember that not every team member will interpret your vision the same way. An article in the Harvard Business Review breaks down communicating company vision into four components: listeners, points of view, actions and benefits. It suggests you must understand your “listeners” (or team members) before you begin communicating the vision. Once you understand your listeners you can then break the vision down into specific points of view – consider this the “why” behind your vision. The next step is to use your vision to inspire action, or as the article puts it, point your team in the right direction. Finally, you must demonstrate the benefits of achieving the company’s vision to gain buy-in from team members. Communication is key in every stage of a startup’s lifecycle, but developing effective communication habits in the early days of your startup will strengthen both your team and your company as you grow. 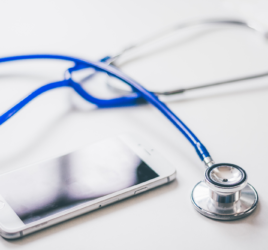 Building a routine of checking in with team members on a daily or weekly basis can help you to detect team issues before they become major problems. Some teams benefit from morning team check-ins. 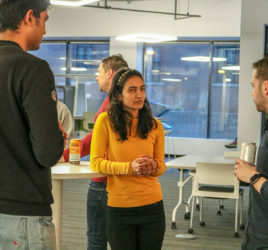 According to one entrepreneur, having each team member give an update on things like what they accomplished yesterday, what they plan to complete today, if there are any challenges they’re facing, and how they are feeling that day is a great way to keep the team engaged and up-to-date on what’s happening in the company. They note that understanding how someone is feeling on any given day can help you avoid team friction and assumptions about why someone may be underperforming. When your team grows too large, it’s recommended you split the daily check-in meeting into multiple groups based on what everyone is working on. If you have remote team members, you can use tools like Slack to conduct your check-ins. Whether you’re building a team from scratch or you’re adding members to a growing team, it’s important you carefully consider which strategies you use to build your team. With these tips, you will be able to find, build and grow an effective startup team.